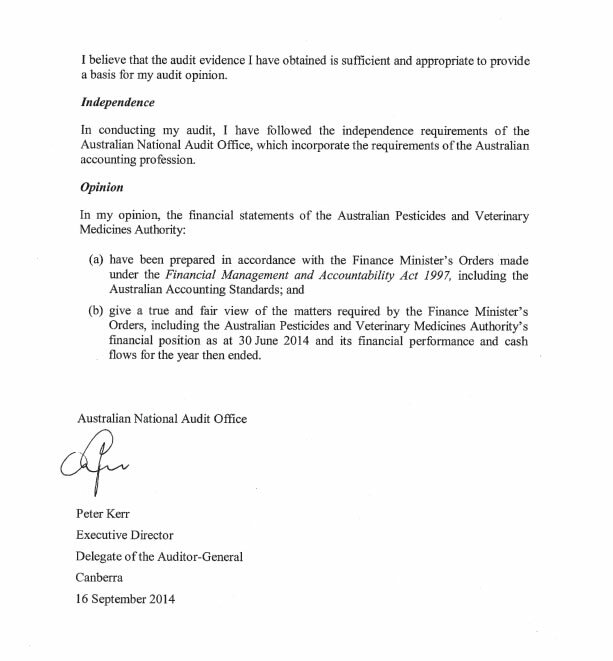 Tables 12–15 give an overview of APVMA financial performance for 2013–14. 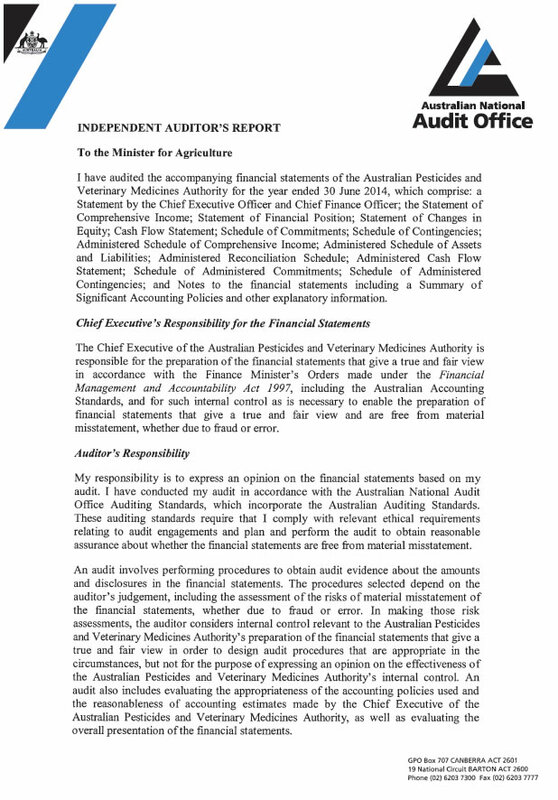 Full details are in the audited financial statements on the following pages. The APVMA's total income for 2013–14 financial year was $28.275 million (Table 12), a decrease of $2.137 million (7.03 per cent) from the previous year. This decrease is largely is due to the returning of $2.0 million to the budget as part of the Better Regulation reform funding agreement. Total operating expenses for 2013–14 were $31.997 million (Tables 14 and 15), an increase of $0.693 million (2.21 per cent) from the previous year. We recorded a net operating deficit of $3.722 million for 2013–14. This was primarily due to the spending of unspent funding for the Better Regulation reforms that had been received in previous years as well as the returning of $2.0 million to the budget as part of the reform funding agreement as mentioned above. As at 30 June 2014, the Better Regulation reform funding has been fully expensed. Our equity at 30 June 2014 was $8.798 million. 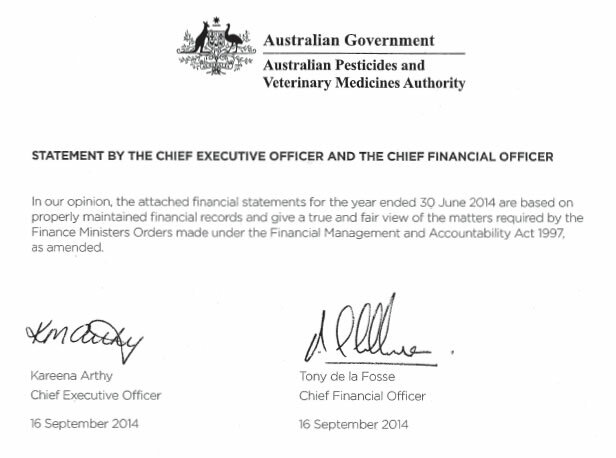 The APVMA achieved an unqualified audit result, and there were no adverse findings. Our revenue can vary significantly from year to year as a result of fluctuations in sales of pesticides and veterinary medicines, due to changing environmental conditions. To manage this, we aim to hold a financial reserve (which forms part of our equity). Without this financial reserve, we would risk periods where our liabilities would exceed our assets (negative equity). The financial reserve is based on three months of operating expenses and is currently set at $7.0 million. New cost-recovery arrangements commenced on 1 July 2013, following the development and subsequent approval of a cost-recovery impact statement (CRIS) during 2012–13. Implementation of the arrangements outlined in the CRIS was intended to coincide with the commencement of the Agricultural and Veterinary Chemicals Legislation Amendment Bill 2012. This was proposed to commence on 1 July 2013; however, amendments to the Bill in the House of Representatives revised the commencement date to 1 July 2014.
implementing reductions in the levy rate. electronic conversion of hard-copy applications. In 2013–14, we continued to provide input into the Australian Government Department of Agriculture's first-principles review of the cost-recovery arrangements for the APVMA. This review seeks to examine and recommend options to strengthen the financial sustainability, transparency and accountability of the APVMA's cost-recovery arrangements. No advertising or market research was conducted during 2013–14. In 2013–14, 40 new consultancy contracts were entered into, involving total actual expenditure (including capitalisation) of $1 495 000. In addition, 19 ongoing consultancy contracts were active, involving total actual expenditure of $1 623 000.. Exemptions to these requirements may be approved in some circumstances. Annual reports contain information about actual expenditure on contracts for consultancies. Information on the value of contracts and consultancies is available on the AusTender website (tenders.gov.au).